Mechanical openings (resulting from the incomplete fusion of curd pieces) are common in many cheese varieties where they may or may not be considered desirable. However, some internal bacterially-ripened varieties are characterized by the development of eye holes caused by gas, produced by bacterial metabolism, being trapped in the curd. In many cheeses, gas production is undesirable but there are two main families of cheeses where eyes are desired. Dutch types (Edam, Gouda and related varieties) have occasional small eyes while cheeses related to Swiss Emmental are characterized by large eyes. 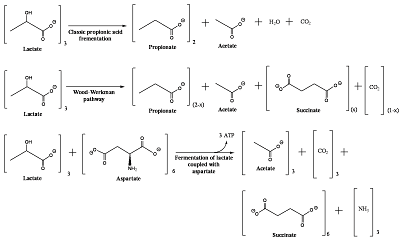 While eye development in Dutch-type cheeses is due to citrate metabolism, in Emmental-type varieties, CO2 is produced by Propionibacterium freudenreichii from lactate during the "hot-room" step of ripening (see below for overall chemical equations). CO2 migrates through the cheese curd until it finds a point of weakness where it accumulates to form an eye. Interestingly, only a small proportion of the CO2 remains in the eyes; most remains dissolved in the aqueous phase of the cheese or is lost from the surface. 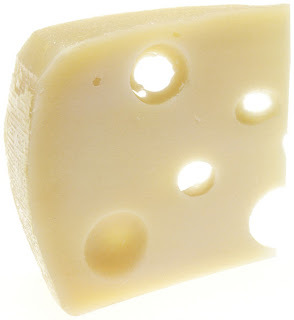 Eye development in Swiss cheese depends on the rate and quantity of CO2 production, the number and size of loci for eye development, CO2 partial pressure and diffusion rate and of course cheese texture and temperature. P. freudenreichii is very sensitive to salt and consequently Emmental-type cheeses have amongst the lowest NaCl levels of all varieties.